Trump says officials will announce next week that “100 percent” of the ISIS caliphate had been liberated. 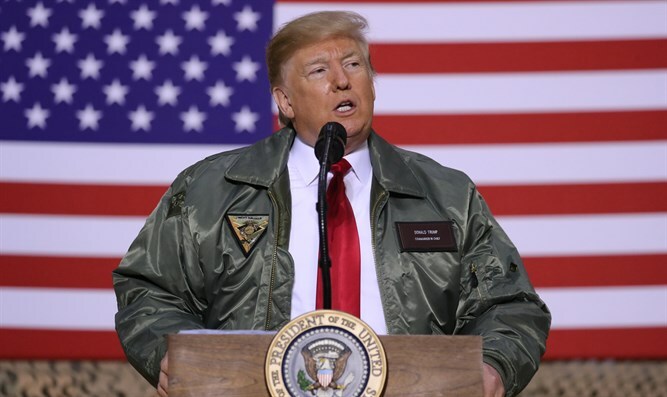 US President Donald Trump said on Wednesday that officials would announce next week that “100 percent” of the Islamic State (ISIS) caliphate had been liberated. “The United States military, our coalition partners and the Syrian Democratic forces have liberated virtually all of the territory previously held by ISIS in Syria and Iraq,” the president said during a speech to the Ministers of the Global Coalition to Defeat ISIS, according to Politico. “It should be formally announced sometime probably next week that we will have 100 percent of the caliphate,” said Trump. ISIS overran large swathes of Syria and neighboring Iraq in 2014, proclaiming a "caliphate" in land it controlled. However, despite losing the physical caliphate, thousands of ISIS fighters remain in Iraq and Syria, and the group continues to carry out terrorist attacks and could easily move back into territory it once held if American forces withdraw. The anti-ISIS coalition estimated last year that ISIS currently holds only about 1 percent of land in Iraq and Syria, but it continues to hold territory in Afghanistan, Libya, the Sinai and West Africa. In December, Trump unexpectedly announced that he was immediately withdrawing troops from Syria, a move that received backlash from fellow Republicans and caused Defense Secretary Jim Mattis and Brett McGurk, the special presidential envoy to the coalition to defeat ISIS in Syria and Iraq, to resign. The president conceded, however, that even with the caliphate gone, there would always be “sick” and “demented” people.